I saw a TV interview with Dave Barger, JetBlue's current CEO, on which he answered some passenger questions. One passenger asked why the airline was charging for pillows and blankets. Barger's reply? He said that although JetBlue was charging for those amenities, every passenger also got a leather seat and 36 free channels of live TV. I couldn't believe my ears. JetBlue, the symbol of how an airline is supposed to treat customers had changed strategies. It seemed they are now opting for the "battered-wife" customer service model. It's akin to when a battered wife asks her abusive husband why he beats her and he replies, "What are you talking about? I put food on the table and provide a roof over your head." When a customer complains about something, the appropriate response is to explain the circumstances or apologize. Offering a "counter argument" completely misses the point and ignores an opportunity to do right by your customer. Complaints are a cry for help! A legitimate customer service complaint had been raised to the most senior executive in the company to which the best answer he could muster was a memorized boiler plate of product features. Did I miss something? When did American Airlines buy JetBlue? When a company says they "promise" to do something, that's a pretty weighty commitment. Uphold that promise and your customers will give you a lifetime of loyalty, even if you screw up now and then. Violate that promise and you can quickly destroy any sense of authenticity you may have built. Worse, you quickly find yourself looking and sounding exactly like everyone else. JetBlue used to serve as a prime example of exactly how to treat customers. They were teaching the old boys that it's how you treat people not just the degrees of pitch your seat reclines that really matters. Sadly, since the departure of JetBlue founder David Neeleman, JetBlue are starting to act and sound like everyone else. Sadly, JetBlue is now teaching us a very different lesson about customer service. JetBlue says the reason they exist is "to provide superior service in every aspect of our customer's air travel experience." They even offer a bill of rights which includes being honest about a situation. David Neeleman, JetBlue's founder and former CEO stood out among CEOs in and out of the airline business for his willingness to be honest. After JetBlue suffered serious service problems during a big winter storm in 2007 (hundreds of passengers were left stranded on planes for 6 or more hours), Neeleman went on national TV and said, "we screwed up." It was that kind of honesty which endears customers. The JetBlue board ousted Neeleman three months later preferring the leadership style of Dave Barger, JetBlue's former COO. In an age in which too many companies opt for the battered-wife customer service model, JetBlue really did seem to believe in humanity. Neeleman maintained a blog (or flight log, as he called it), the current CEO does not. JetBlue used to have one class of service aboard their aircraft - we are all equal, we are all human - they professed. Now, however, JetBlue allows you to pay a little more money to get a little more legroom. I hate to be the one who points out the obvious but that's a class (though I concede, there is no curtain). 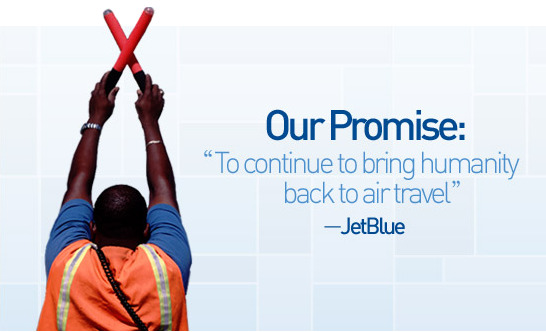 With or without Neeleman at the helm, honesty and humanity should still prevail at JetBlue. Barger simply had to explain that the oil crisis had put tremendous pressure on the airline and it pained them to have to nickle and dime their customers but it was either that or suffer much more serious set backs. All he had to do was appeal to the humanity of their customers to work with them in this time of need. There are many advantages to not making any promises to your customers. For one, you have more flexibility. Secondly, it's much easier to meet low expectations. The disadvantages include vastly reduced customer loyalty (different from repeat business) and little opportunity to differentiate. Making a promise and operating your business based on Why your company exists means you hold yourself to higher standards. You have to be less flexible because you'll need to opt for what's right not for what's most profitable or most expedient sometimes. But the benefits include greater long term value and much more loyalty and support from customers, even when you're not operating at your best. I'm just sad to see one of the few companies who believed in customer first start to show signs of cracking. I like your "strategy" ideas. Here’s a better response: "Maam, we appreciate your concern, however due to rising costs we must charge for certain amenities. We do, however, hope you are comfortable during your flight and enjoy the many cable stations we offer. And when disembarking, we hope you are able to reach your destination sooner as we exit and load passengers from both ends of the plane..." READ: I’m not tolerating your whining, and if you don’t like it, go sit jammed up on US Air where they charge for water and $10 for an iceberg lettuce salad. I’ve worked retail and various customer service industries, and believe me, the customer is not always right. They complain FAR MORE than they complement. And sometimes they are right, but a product should never be thrown under the bus in order to pacify a customer. Whatever the situation, however, customers should be treated with the utmost respect, and issued an apology and a solution to the concern. "one of the few companies who believed in customer first"
I'm sorry but I have to fundamentally dispute that claim. No company that literally keeps it's customers held prisoner for 11 hours without adequate food, water or sanitation. I don't care what JetBlue claims: I won't ever fly them. As far as I'm concerned their CEO should be hauled before the Hague for inhumane treatment. By clicking "Post" / commenting on this blog, you agree to abide by the Terms of Service that govern the use of this website. in your inbox every day?